Q: What was your first climbing experience and when did you decide to climb Mt Everest? My first climb was Kilimanjaro back in 2002. And the idea to climb it came out of the blue while I was on a safari trio and got my first glimpse of this huge mountain. I vowed that I will come back to climb it which I did. But with very little knowledge on what to expect, I was absolutely and hopelessly miserable by day 3 and doubted my self! 4 days later, after sucking it up and pushing through, I stood on my first summit and my life changed after that. I just enjoyed pushing myself to where I never thought possible and it just gave me a different outlook on life. I decided to climb Everest when I was in Antarctica. When I was able to climb in 60 degrees below zero, I overcame my biggest fear of extreme colds and I felt that maybe I am ready for the Mighty E.
Q: What has been the hardest part of your Everest experience? Every day brought with it so many challenges. As you will soon learn, the only constants are adversity and change and the mental toughness is much needed there. My first time to attempt climbing to camp 3 was horrible and I had to retreat before clipping to the ropes as I couldnt warm my self up. It was very hard for me to be feeling teh freezing cold, getting pain and numbness in my fingers and toes ad decide to turn around when all my team mates are climbing up! But that day the goal was not the summit, it was taking care of myself and avoiding a frost bite! Next day I attempted climbing it again and succeeded and caught up with my team. It was like losing the battle but not the war! Q: And what was the most detestable section of the South Route and the one you enjoyed the most? I hated the ice fall. The fact that you are climbing a living monster that moves all the time is scary. Even when you have to catch your breath – and your lungs are screaming for oxygen – you still have to push through and not stop fearing an avalanche or a serac falling or a crevass opening ! I enjoyed the summit push actually – relatively speaking of course as it was like climbing to heaven! My favorite part was taking a heli out of base camp after 60 days of climbing! Q: Who would you climb with if you’d have the possibility to choose anyone in the world? Q: Do you have any source of inspiration to climb and achieve other goals such us opening you very own adventure travel company in the Middle East? Everything inspires me and not one thing!One has to be receptive to all these positive thoughts and signals around to live with positive attitude. I always first and foremost do things for me – I hope this doesnt sound eccentric, but if I earn my own self respect then I can in many ways reflect and connect with what is around me. The things I felt, the lessons I learned from all my adventure travels, and the people I met who influenced me big time all made me open my own adventure company. I want people to see and feel what the world has to offer! Q: If you have to think of the most valuable advice for anyone climbing Everest, what would it be? One step at a time, that’s all it takes. Do not make any decision based on the ” summit fever”. The mountain will not go any way. Be ready for the emotional and mental challenges that this huge mountain will present to you. And lastly respect Everest and love it ! Q: And as entrepreneur in the Middle East, what is the advice you can give to other women attempting to “climb her own mountain”? The only person who can define what you can or can not do is only you! If you believe in it, go for it. Q: What is your favorite piece of gear? Q: And your favorite movie and book? I loved “sorrow mountain” about a nun from Tibet struggle in the Chinese prisons. I have learned so much from this book. I am not sure about my favorite movie but one that comes to mind is touching the void – great book and great movie! Q: Do you have any preference in terms of brands to choose for your climbing challenges? I am a gear addict!! Mammut remain my favorite though. Q: Do you consider Everest the most challenging climb you have done up to date, or do you have other experiences that put you to the limit at lower altitudes? Overall, Everest was the most challenging. However even MB once humbled me big time by its fierce weather and forcing me to turn around! 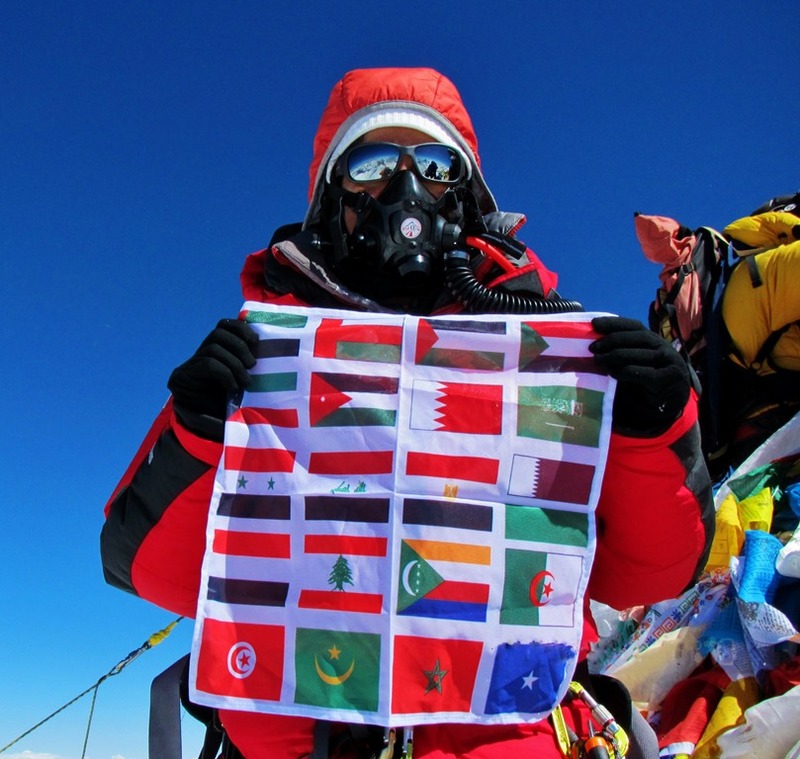 Q: Are you planning to complete the 7 summits anytime soon? Q: If you can choose any mountain to climb in the World, which one would be? Q: In terms of your plans for the future of Rahhalah Explorers, are you considering organizing very challenging trips and expeditions to places like The North Pole? Of course, any wild adventure you name it we will do it ! Q: Out of all destinations and activities organized under the brand of Rahhalah Explorers, what are your favorite and why? Kilimanjaro. We have a big family over there – our local support – and they really feel like family not only to me but to my clients as well. People are so kind, humble and go out of their way to make you feel welcomed and comfortable. Also, Kilimanjaro is a relatively beautiful mountain, non technical and highly supported. therefore it is doable and feels like a vacation.